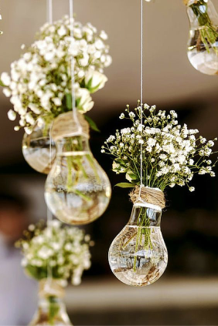 While tradition reigns supreme for some elements of your wedding and it’ll keep the older generation happy, it’s also fun to inject some personality and add your own touch to certain aspects. There’s so many sources of inspiration online and we’ve noticed a few key ideas emerging, so we’ve pulled together a curated trend edit for our 2018 brides. 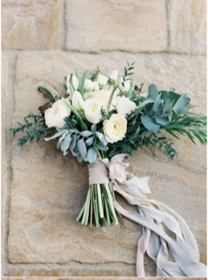 Work this into your colour scheme via flowers, bridesmaid dresses or table decorations. 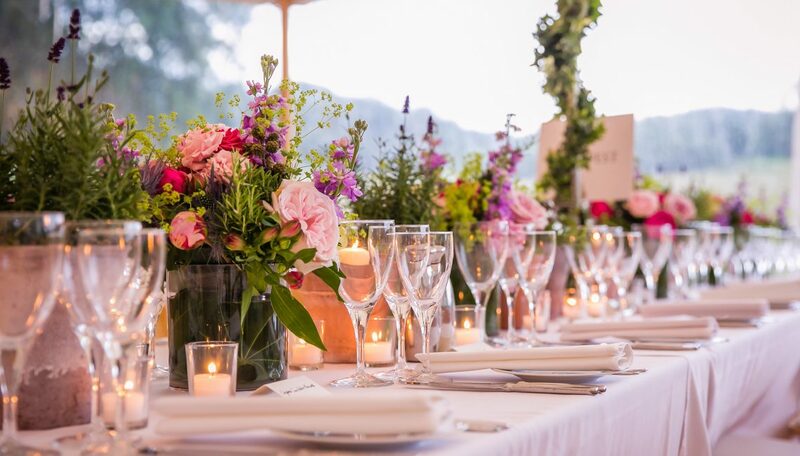 Injections of colour can instantly brighten up your dining area – this can range from linen napkins, table runners, colourful candles and water glasses etc. 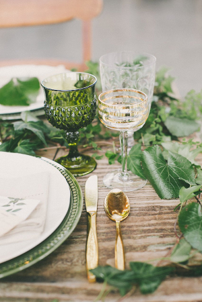 Classic Crockery is a go-to for water glasses in every colour imaginable! While this is great for inspiration, try not to be overly influenced by Pantone’s favourite shade. 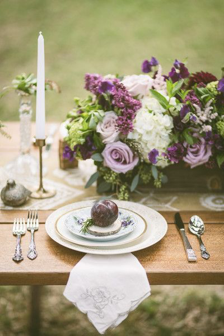 There are other variations of purple out there– have a look at lilac, lavender and mauve as well as ultraviolet, to establish what works best for your wedding. 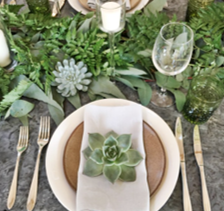 Greens and natural foliage continue to be key for florals after Greenery was named 2017’s Pantone Colour of the year. 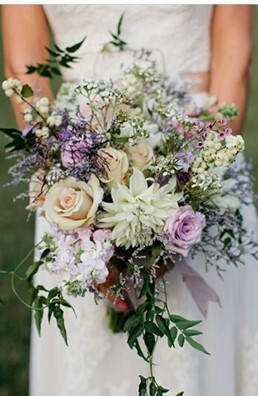 Free form bouquets, wild flowers and natural arrangements are great for a whimsical, bohemian look. 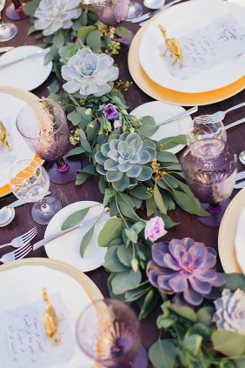 Small terracotta pots are a fun alternative to traditional floral arrangements for the table. 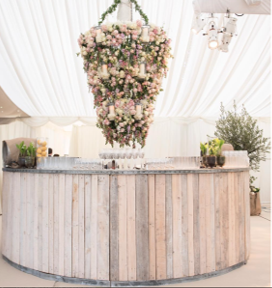 This works particularly well on long wooden farmhouse tables or zinc top tables for a less formal marquee wedding. These first caught our attention at some beautiful weddings last year and we expect to see this trend to evolve to greater heights in 2018. 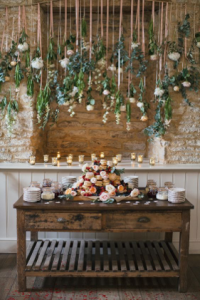 The bonus of suspended floral displays is the space this frees up on tables for sharing platters, candles and additional decorations. 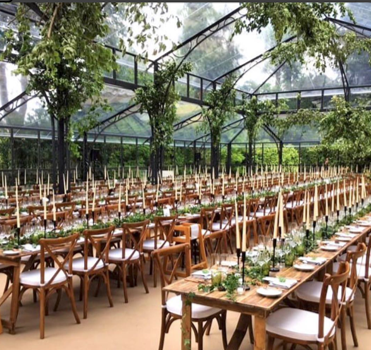 In marquees, the opportunities for hanging flowers are endless – choose hanging hoops around sperry tent poles or ladder structures hung directly above the dining tables, with flowers intricately woven through the structures. 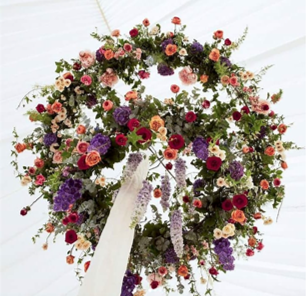 For more of a statement, you could also consider overhead floral canopies, featuring long stem flowers (see images). 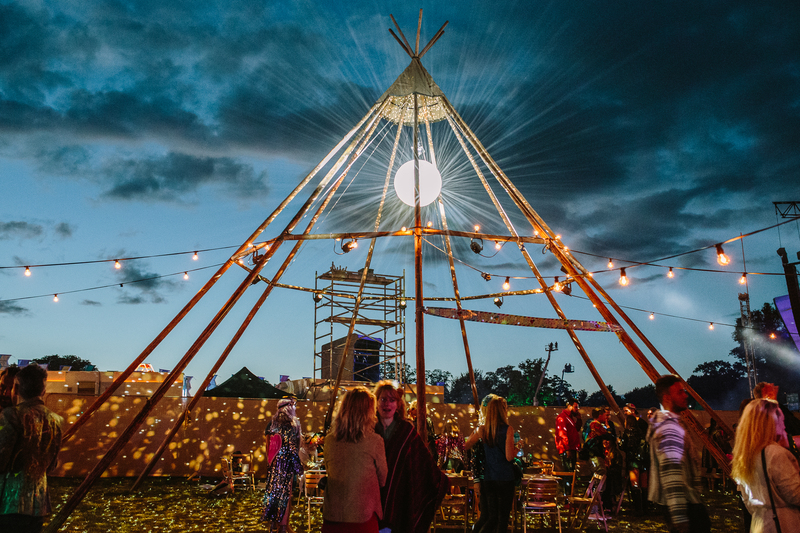 Festoon and storm lanterns will be a continuing trend for brides with festival-inspired marquee weddings this Summer. 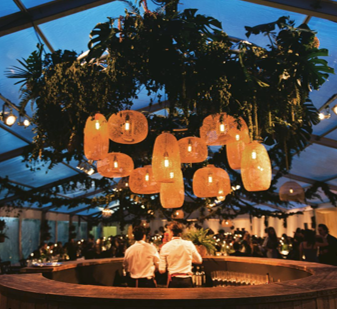 Rattan lighting is a newer idea for lighting and one we are particular fans of. 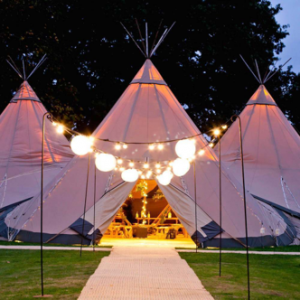 Check out Folly Hire for rattan items to hire for your event. Translucent elements are an eye-catching trend for 2018. 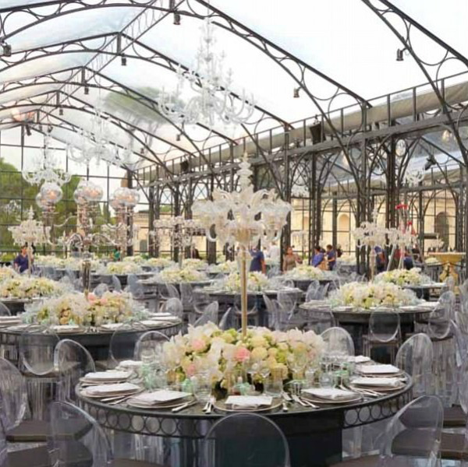 Pippa Middleton’s wedding in a PBI Structures glass structure last year is a stellar example of this trend at its best. 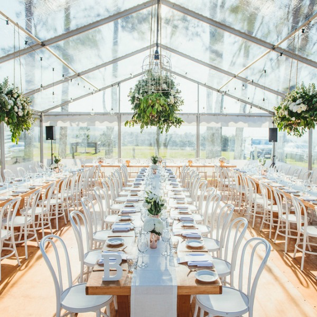 Clear-span marquees allow for uninterrupted views of the scenery and starry nights. 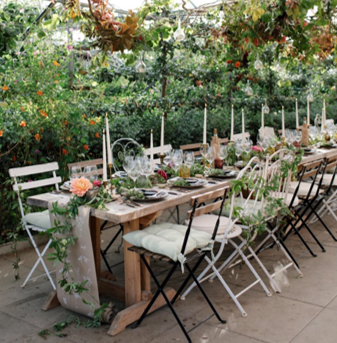 You can create a botanical greenhouse feel as Knot and Pop has done so cleverly (see images). On a smaller scale, why not consider seating plans and signage on perspex signs.